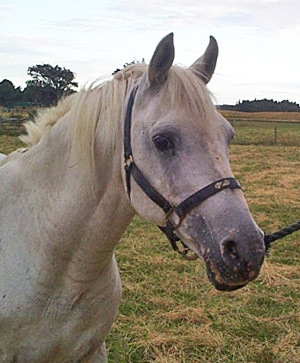 Many Crabbet arabians were imported to New Zealand in past decades. Several were exported out of the country again, mostly to Australia. Our recent imports are among only a few in recent years. Here, we’ve attempted to list some of the imports, their history, and the pure crabbets that they left. The PCs are listed in bold. Information is gleaned from stud book records, online sources, and arabian contacts. The list is by no means exhaustive, and is a work in progress. Ezrah [1944 grey] (Raktha x Ghezala; Kehailan Rodan) Bred at Crabbet Park, exported to NSW, Australia by Mr E Hirst in 1946, then imported to New Zealand by ID Mcindoe to Winton. He was registered with the NZ Pony Breeders, as this was years before New Zealand had its own society or stud book. From our research we see he left eight purebreds (all out of Sadik), but many partbreds, and his daughters bred on well. Silver Sparkle [1947 grey] (Oran x Silver Fire; Hamdani Simri), bred at Crabbet Park, and imported to the North Island in 1948 by a Mr Booth. Later bought by Lester Marshall of Holly Farm, in Canterbury (in the mid 1960s?) where he was used extensively. Then bought by Andrew Sharf in California and exported in 1969. Died 1970 of colic, leaving two male sons. Records indicate he had 20 purebred foals in New Zealand. Grey Swirl [1956 chestnut] (Electric Silver x Grey Coronet), bred at Fenwick Stud and imported by AL Sisam & sons. Used from 1961 to 1977. Crescendo [1963 grey] (Greylight x Carla), bred at Fenwick Stud and imported by AL Sisam & sons. Used over their mares and outside mares from 1968 to 1982. Bayang [1963 bay] (Fancy Shadow x Rosalina; Kehailan Dajani) was bred by RH Calvert in England, and imported to New Zealand by AR Ayliffe. He was here for only a few years before being exported back to Australia. While here he sired five 100% females and four males. 100% Crabbet progeny listed below. Repartee [1966 grey] (Sindh x Royal Radiance) bred at Fenwick and imported from Australia by PJ Maher. Was not bred from to a very great degree. Bint Kareema (below) was his only 100% Crabbet progeny. Touch Of Magic [1969 grey] (Risheen x Sefra) was imported by Mr & Mrs EW Wilson and stood at Malton Stud for many years, leaving many lovely foals from 1974 to 1991. Unfortunately there were only four 100% Crabbets by him: the colts Dellmount Miska and Dellmount Moon Magic (both from Silver Moonbeam; and Barbara and Ernie Wilson bred the mare Honepuna (from Odoweni), and one gelding Guzunaa (from Odoweni). Touch of Magic’s last colt was Touch of Mann, who is still breeding. Arabian Park Bay Band [1970 bay] (Banderol x Flourish) was imported from Australia by Sandy Duncan of Makahiwi Stud. There appears to be only six registered progeny by him. 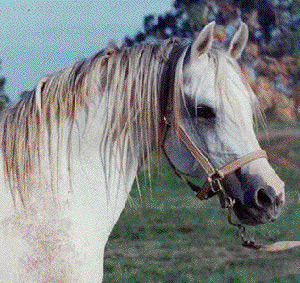 Rosland [1970 grey] (Sindh x Roselight) bred at Fenwick and imported from Australia by Ken Bayne for his stud. He was then sold to a station and used for breeding hacks until Anne Hutchinson bought him and registered three geldings and one filly. Indian Fire Dance [1971 chestnut] (Dancing King x Indian Gem) Bred in England by D.D. Wright and imported in utero to Australia, then imported to New Zealand by Mrs C Skinner. He left many foals up to 1993, but the only 100% Crabbet was El Indian Flame 1974 (x Tonkanoona), bred by AW Skinner and owned by Mrs DE Rochford. Ranaarb 1987 chestnut (Rasham x Liquid Amber) was imported into New Zealand as an older horse. Silver Omen 1989 grey (Somerled x The Cameo Rose) imported from Australia in 2006. Silver Moonbeam (ex Eldoura) and Silver Dawn (96.67% ex Countessa) both by the imported Fenwick Stud sire Silver Moonlight (1951, imp UK, Indian Magic x Silver Fire), came to NZ. Robinia [chestnut 1960] (Shafreyn x Ruheym) Imported by Sue Spratt with her daughter Beenie (grey 1967 by Fabulous) at foot. According to Australian stud book records, she left the filly Suumah (1969 by Sindh) in New Zealand. Tonkanoona [chestnut 1962] (Indian Magic x Crystal Star) was imported from England, by A.R. Ayliffe. In New Zealand she left El Indian Flame (above) and El Magic Stardance (exp) both by Indian Fire Dance; and Odoweni (1976 chestnut by Bayang), owned by Barbara and Ernie Wilson. Odoweni was bred by AR Ayliffe and owned by E&B Wilson, Wyndham. She had two foals by Houssain (Odwain and Houdoo; 89.06%) the two 100% Crabbets Guzunga [1974 grey gelding] and Honeypuna [1975 grey mare] both by Touch of Magic; and Odette [2977 grey mare] by Waimeha Marendo who was 96.4% Crabbet. Aurora Stud bred three foals from Odette, one by Touch of Magic and two by Dellmount Phaeton. Sarana [grey 1961] (Bright Shadow x Rasana) was bred in England by Mrs E N Thomas (who also bred Crystal Star) and imported by AR Ayliffe. In New Zealand she left: Tinkabelle [1966 iid, bay by Rozak’s Star], and Aweda [1967 bay gelding], Fanny [1968 grey], and Ranasa [1969 grey], all three by Bayang. Ranasa was exported to Australia, where she left seven fillies and six colts. She was the dam of Abiathar in New Zealand. Bright Day [chestnut 1967], (Sindh x Brilliant), imported from Fenwick Stud by Marlene Feaver of Opunake, and was later owned by Tarapuruhi Arabians. No 100% Crabbet progeny in NZ. 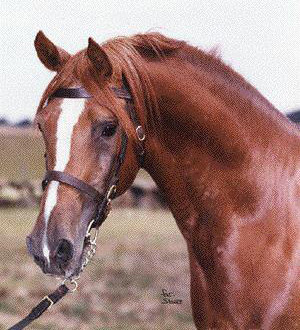 Bayang also sired Tinderbox, [1968 chestnut mare] out of Crystal Star. Tinderbox had four fillies and two colts, all by Shereef. They were 98.82%. Koumitte [1970 bay mare], (Bayang x Crystal Star). No registered progeny. Moondream [grey 1971] (Remembrance x Moonoura) Imported by Mrs C McClusky. No 100% Crabbet progeny in NZ. Kareema [grey, imp GB] (Magnet x Fafika). Imported from the UK by Helena Patchett- Carter. She left Bint Kareema (Repartee). Starglen Bouquet [1989 brown] and Starglen Sensacion [1990 bay] (Arabian Lodge Boragh x Santarabia Fame) were imported by J Webby in the early 2000s. No 100% Crabbet progeny in NZ. Fenwick Regenta [2003 chestnut] (Fenwick Phantom x Fenwick Regina) Imported in 2006; has five 100% Crabbet progeny in NZ. Silver Crescent [1996 grey] (Overdale Farm Magic Silver x Overdale Farm Rishalanie) Imported in 2007; two 100% Crabbet daughters in NZ.